Cupcakes 'n Daisies: Stalking my favorite designers at market . . So the first thing I did when I got my market directory was to locate the booths of some of my favorite quilting folks. After thoroughly checking out the Miss Rosie Quilt Co booth I went on the hunt for the Sew Kind of Wonderful booth. Sew Kind of Wonderful is run by sisters Jenny Pedigo and Helen Robinson. They developed the Quick Curve Ruler and have over 25 pattern designs that use their ruler. I become acquainted with Jenny a few years ago when she quilted my Belle Meade top. It's one of my favorite quilts that is out year round, either on a quilt rack, the middle of my bed, or on a red couch. 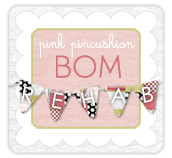 I follow the Sew Kind of Wonderful blog and even got to block test a couple of blocks for their BOM, I was eager to see first hand the wonderful new projects that I had seen online. I was not disappointed. This was another booth that was filled to capacity with wonderful inspiration. As is the case with most quilts, they looked so much better in person, which I found impressive since they look very attractive online. This block is from the Deco Shimmer pattern, one block finishes at 22 inches. 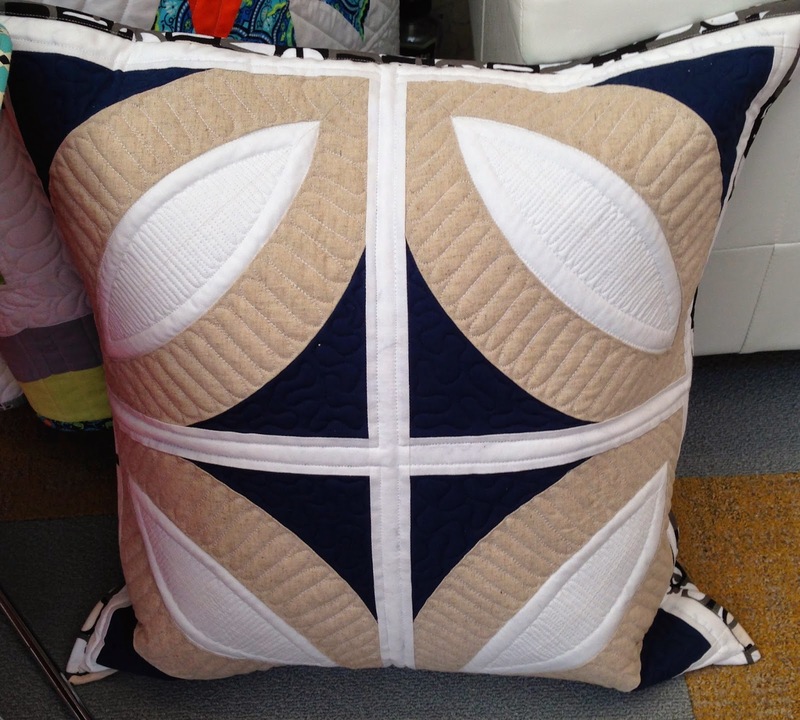 I love the quilt but think this pillow would look great in my living room too. Besides all the single patterns available (click here) for the ruler, Jenny and Helen also have a book out, Contemporary Curved Quilts. Here's a picture of the Fun Poinsettia table runner that is a free tutorial here. These blocks are 20 inches square. As pretty as it looks on their blog it looks so much prettier in person. Additionally, I don't have good feel for sizes when they are listed online, but a 20 inch block is a good size block, I really liked seeing all the big blocks. Here's another big block that caught my eye. Jenny was kind enough to give me a Quick Curve Ruler as a giveaway. And I'm adding one of these patterns, your choice, Deco Shimmer, Metro Hoops, Metro Scope, Urban Nine Patch, or Metro Rings. The last time I blogged about the Quick Curve Ruler I received several comments from folks afraid to give it a try. I'm a big fan of specialty rulers and templates, they usually make my projects go faster and always make my blocks more accurate. That's why I use them. The Quick Curve Ruler does make accurate blocks, but what I really like about it is its versatility, it makes all sorts of blocks, unusual blocks that you can't make with any other ruler. You have several options when it comes to flying geese rulers, pineapple rulers, hst rulers, but this is the only ruler that I'm aware of that will give you these great curved blocks. Additionally, the pattern directions are very clear, you will have no difficulty understanding how to use the Quick Curve Ruler. Here's a diagram from one of their patterns that shows you exactly where and how to cut your fabric. Believe me when I tell you that you will not struggle with this ruler! This is another freebie on the Sew Kind of Wonderful site, its called Spring Fling, click here. It's on my To Do list too. Each petal block is 22 inches. So to be eligible to win the Quick Curve Ruler donated by Jenny and one of the five patterns that I bought at market, your choice, please leave a comment telling me what your big summer plans are. Last summer I went to Paris, this summer I'm taking it easy and staying home, I'll have to live vicariously through you and your summer adventures. You have through today, May 23rd, to leave a comment. If the USPS will deliver to your address you can be a winner. There are even more market pictures and giveaways to come, please stop back by. One of my quilty peeps extolls this ruler. I admit, I wasn't too interested until I saw your post. The quilts featured here are fresh and fun. As for Summer plans, there are many short trips in store: Myrtle Beach, Holden Beach, Trumbull, CT and visitors from the West Coast. It should be a great Summer! I have been a little afraid of the the ruler so I haven't purchased one. A friend of mine has the ruler and loves it and you are recommending, guess I need to get it! My husband has been wanting me to make a double wedding ring quilt and this ruler might would be what I need. 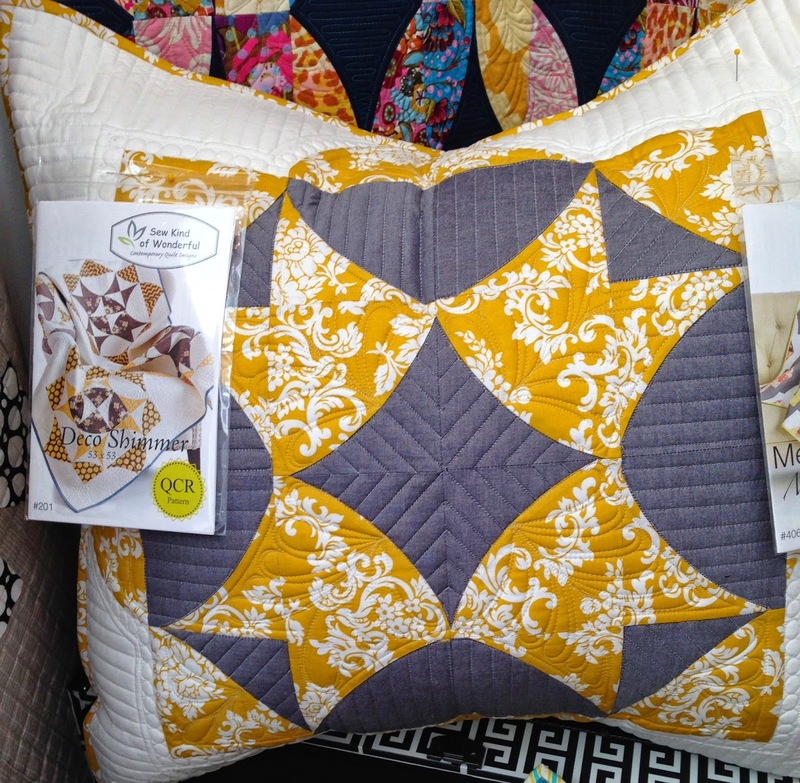 I remember Jenny showing the quilting on your Belle Meade quilt and loving how she quilted it. I don't really have any big summer plans other than a trip to NC to babysit. I tend not to take big trips in the summer. In the Spring we did the Natchez Trace and Vicksburg. In the Fall maybe to UP in MI to see the Fall color and visit a friend. Thanks again for the wonderful Market pictures! It's not officially summer until we have our beach vacation where family comes in from far and wide to enjoy a week together. I am afraid of circles and curves in my piecing but these patterns are so beautiful and simple--the ruler looks like it makes something new & scary doable--I think I could give these a try!! This is one cool ruler, I have loved seeing the projects that come out of this!! Scream NO at anytime, but I am in a full on cleaning mode this summer, the garage, all closets, windows and even painting is going to be involved!!! Hot and kinda dumb, but the fresh-up and clean-up is what I want to do on my summer vacation!!! Thank you for your post about then Quick Curve Ruler. I've visited the Sew Kind of Wonderful blog and saw their beautiful quilts but wondered if I would ever use the ruler. Your post has me inspired! My husband and I recently visited the Olympic Peninsula but do not have plans for the summer. We are thinking of visiting Coeur d'Alene, Idaho and/or Victoria BC this Fall. No big plans for summer, just the usual quilting and gardening. I'm a follower of Jenny, admiring her work, wishing I could sew curves with such ease. What an inspiring post! Winning the ruler and pattern would give me the courage to try curved piecing. This summer I'm taking my mother to a family reunion and cleaning out closets!! Thanks for the giveaway! That ruler looks like a slick piece of work! 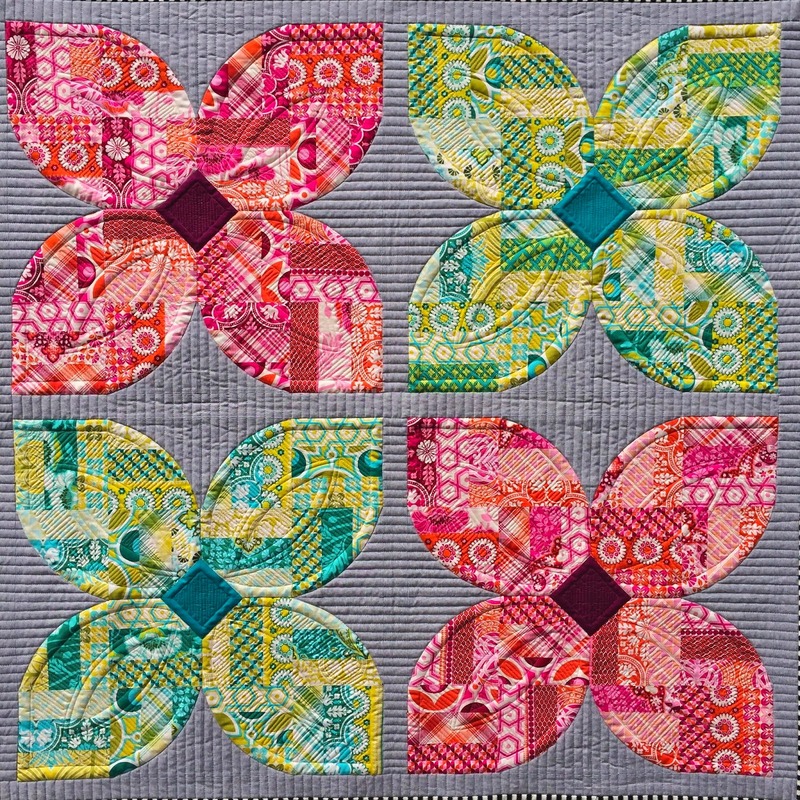 I love that urban nine patch pattern; the design is bold and the colors are even bolder. We will be heading up to Maine for a week. I have wanted to go there ever since my Mom read One Morning in Maine by Robert McCloskey to me when I was a little girl. (a long, long, time ago). Hope it meets my expectations! I am traveling to Montana to take a class with Quiltworx and enjoy the beautiful Montana scenery. Can't wait. I have plans for a trip to Chicago and then the rest of the summer....sew, sew, sew! I've come close to buying this ruler so many times. Love all her patterns! I'm staying home this Summer too - looking forward to the kids coming for a couple of weeks! I have been following Some Kind of Wonderful blog and admiring the creative ways the ruler has been used, and they keep coming up with new, innovative designs! Oh...summer plans are light this year also but thing a very long weekend to the coast of Maine is on the plan list...this is the best time for us to unwind and plan ahead. Love the local sea food and have quiet time on the deck of the B&B we stay at! My plans for the summer include a trip to Quilt Odyssey with some friends, then later a two week stay at Virginia Beach with my hubby. I take my sewing machine along and spend a lot of time piecing while at the ocean. We're doing a lot of construction in our backyard with new patios, a water feature and lots more. Once completed, I'll be staying home and doing some handsewing under my new pergola. Would love to try this ruler, the patterns look cool too! Well I'm in australia so we are going into winter now. But we have a visit from my husbands son to look forward to - he lives in the UK so it's his summer holiday - does that count? My husband & I just returned from a lengthy visit to Naples, FL, so I think that my summer plans will focus on tending to my home and garden. And quilting, of course. Thanks for the generous giveaway, Thelma. #1 on the bucket list will be this summer- our cruise to Alaska! Can't wait! I've never done any curved piecing, so I think this ruler is a "1-800-gotta-have it" if i ever get up the nerve to try. The patterns are amazing! I'm hoping to spend tons of time this summer knocking some of my UFOs off my TO DO list, in between trips to the beach. I live on the seacoast in New Hampshire. 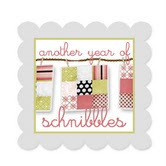 Love attending Quilt Market vicariously through your great posts! Thank you! Brewer baseball games, International Quilt Show in Chicago, and Baltimore to see our daughter are our plans for the summer! Oh, and of course quilting!! Also, congrats on your Door County Cherry Baskets quilt at Paducah. It was gorgeous! I have been eyeing this ruler and the associated patters for awhile now! Thank for the chance to win one. We have not finalized our summer plans but I may be going to Maine in July. We are headed to St Louis sometime in late summer. We always go to a couple breweries and quilt shops. We are going to Arkansas and Missouri in late July. But I've got summer quilting plans too! Hoping to finish up a couple of projects and start a couple more! I've been admiring Jenny's Quick Curve Ruler for a while. I love that poinsettia table runner! Thanks for the chance to win! I work in the ag industry so I don't get much time off during the summer. I do try to squeeze as much social things in as possible. On deck is Shakespeare on the Lawn (Merchant of Venice) and a couple food festivals. Thank you so much for all that you share and your giveaway!!! I am so anxious to try this ruler..it looks amazing as well as the quilts that it can create:) My summer is going to consist of hand quilting on the deck ...just relaxing and enjoying my coffee with a few road trips sprinkled in. I love summer! Loving the market reports and photos! I am going to Quilt Canada in June so that is my big adventure for this year... can't wait! I'll be spending my summer in Mattituck Long Island with my family. In August my son will be going to grad school so I'm sure we'll be spending some summer time looking for an apartment for him. Other than a trip maybe late in the summer to visit my family, I'm going to stick close to home. I plan on sewing a ton, and I would love to try this ruler. Her quilts are amazing! My big summer plan is to stay inside and hand-quilt dreaming of cooler weather! Thanks, Thelma, for your market posts. And if you say the ruler works, I believe it. I remember your posts awhile back about various and assorted tools and rulers you were trying out. They were very helpful. My summer plans are to finish two quilts for the hosts of a cruise I was on a year ago. I'm closing in. Would love to try one of these curved rulers. Think I'll head over to Sew Kind of Wonderful next! My summer plans include a trip to babysit my Granddog while my son and DIL go on a cruise to Cozumel, a trip to visit my Aunt (she is my daddy's twin sister) and a massive undertaking of cleaning out my garage. You see, everything in my garage (including a lot of fabric) has been packed since 2008. My garage is packed from front to back full of stuff that we haven't used and isn't doing us any good in the garage. And with all of that I plan to do a lot of sewing this summer. Whew....I'm tired just writing all of this down....I think I'll take a nap now!!! I'm going to be backpacking the West Coast Trail in Canada in August! No plans for this summer but next year would like to go to Rome. My household will be taking it easy this summer...my baby starts High School in the fall so I'm hoping to have lots of family time! I am going to Yellowstone for the first time. I haven't ever used a ruler like this one but Deco Shimmer is beautiful. Thank you for the chance to win. have a great holiday weekend too! We are taking a nice trip to the beach to celebrate our 30th wedding anniversary! Summer is heavy work season for my hubby, but we have some weekend getaways planned, and we're also planning a big trip in December for our 25th anniversary. I was just at a retreat where a friend was using that ruler. It reminded me of you. I was... hey, I know that ruler! She was making the Metro Hoops with a blue background and it was just gorgeous. This summer I am moving! I just sold my house and I'm closing on my new home mid June. My daughter and son in law are flying in to help me unpack and do a bit of DIY on the new place. Hopefully it will not take me ages to unpack and I can enjoy a bit of the end of the summer. summer is busy on the farm, so I'll be farming away most of my summer....but I always find time to quilt and I"ve been wanting this ruler!!! If I don't win this one I"m going to but it!!! Besides farming there will be some tiime for playing....off to the Bahamas with my little sister who turns 50 in August....then off to Cozumel in late October with the SIL....I feel blessed for sure! I love the look of the petals! I am so getting to love the brighter happier kind of quilts! Those quilts and runners are beautiful! I'll admit I'm one of those chicken gals who's never tried that ruler 'cause it looks kind of scary. The quilts are so beautiful though -- I need to step up my game and try it! As far as summer goes, we're mostly staying home and doing some big projects around the house. This summer I am organizing and sewing. I usually kind of fly by the seat of my pants through summer. I want to try to go to the Sisters Outdoor Quilt Show this year... Thank you for the fun! I would love to play with curves. Hopefully, my son and daughter-in-law will visit! That would be lovely. Otherwise, lots of gardening and quilting. Thanks for the giveaway--I really love the curvy quilts, especially the Metro Rings quilt I've seen around made from this ruler. A friend was just showing me this ruler recently.....I'm intrigued by all the neat designs you can make with it. As for summer plans, none really -- DH is really busy at work. We're hoping to plan something for the fall. This ruler continues to be on my wish list! This summer my husband and I are throwing a big party, for we are celebrating 25 years of marriage! Besides my passion for quilting, my husband and I share a hobby called Letterboxing. It started in Dartmoor England over 150 years ago. We, along with 18 other enthusiasts will be traveling there for 8 days to partake of the way it really was 'back then', walking the moors in the southern part of the country. Leaving for Yellowstone National Park in a couple of weeks, can't wait! Haven't had a vacation for several years. My choice would be Metro Rings. I plan on getting in some local trips since I now have a job with three day weekends - yeah! Plus I will be a brand new grandmother. I am so looking forward to making little soft projects for the new arrival. I just got back from my company seminar and for 25 years of service was given a travel voucher for $2000! A wonderful surprise that leaves me dreaming of all sorts of trips - too many in fact! I also am intimidated by curved piecing, but their quilts are so beautiful! I would love to try the spring fling one that is pictured last or the deco shimmer. Love your blog! Each year, my family (my children and grandchildren along with my two sisters and their children and grandchildren) go to Snowbird for a week of fun and mountain air. We have been doing this now for 38 years! We have so much wild and crazy fun. Other than this trip, I plan on being home spending a lot of days quilting and enjoying summer with my family. Thanks for the chance. Alas I too like you will be living through others this summer. My big plans are to quilt as much as possible. Going to have a long weekend this weekend to kick off that plan. Summer will be mostly at home, enjoying time with my two girls before they head off to college in the fall. My only travel plans are to a reunion of 6 high school friends -- something we do once every five years, to celebrate the "big" birthdays. Thanks for the chance to win. 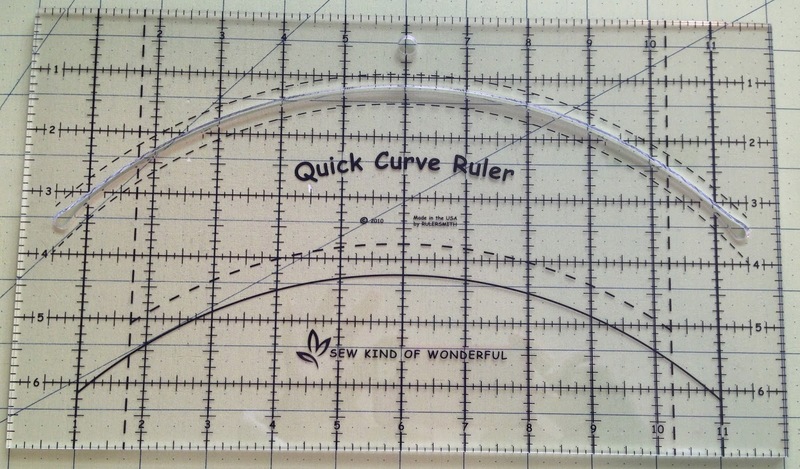 A ruler that makes curves accurate and not scary sounds wonderful. Oooo...... I've wanted to try this ruler for a loooong time! :) I don't have big plans this summer! Lots of swimming lessons for my 3 kiddos and lots of sewing for me (I'm a school teacher, so I get most of my quilt projects done during July and August). Thanks for the chance to win and all of your great QM photos! Oh, I would love to have Deco Shimmer. I am planning on spending the summer in my pool. I'm heading off to Italy and Greece next month. When I get back I'd like to tackle some curved blocks! This Summer is going to be a bit busy. We are headed to Hershey, PA for a few days once my daughter is out of school for some End of the Year fun. In August... we are headed to Walt Disney World! Super excited!! In between, we have a bridal shower, christening, and wedding to attend. Thanks for the chance! 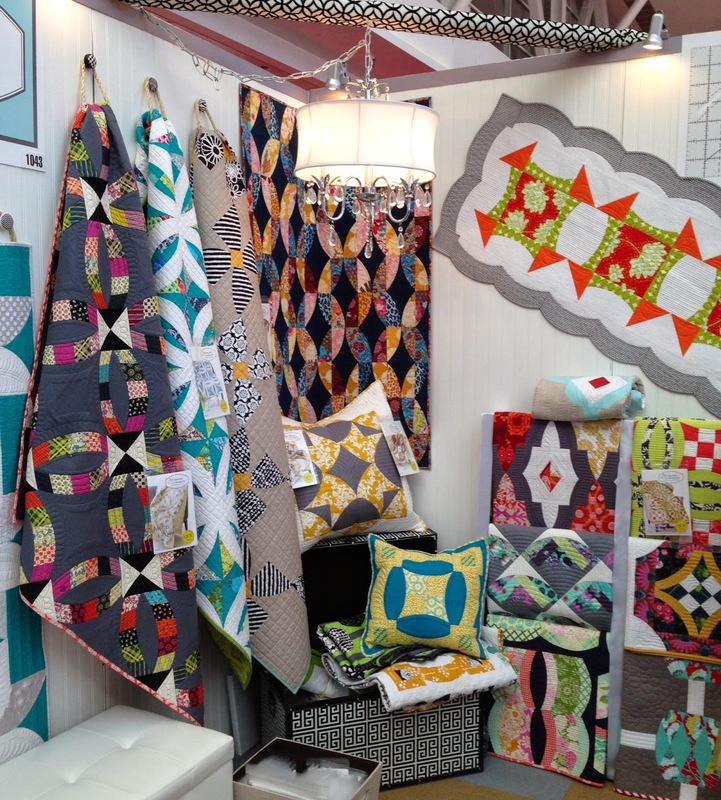 Love all the quilt market pictures. I don't have summer plans, but I do plan to get a lot of quilting done - at least that's my hope. As for summer plans, we are going to take the kiddos camping at the lake a couple of weekends, but nothing major. Thanks Thelma! I love using new rulers and gadgets to make my quilting easier. Thanks for the opportunity. My summer plan is a remodel job on the master bathrooms and mega shelves in the sewing room, and short weekend trips. Have a good summer. There are no big summer plans. Some weddings and spending time with family are probably all our summer will consist of. My grandson's first birthday and a week in the Nc mountains. Thanks for sharing. thanks for such a great giveaway. The highlight of my summer will be traveling to Minnesota for my niece's wedding as well as spending the following week visiting family and friends there. Thanks for the giveaway chance! My big summer plan is the Grand Old Flag retreat at Country Sampler in few weeks. It was great last year, and some of the new friends I made last summer are coming back again, too. Thanks for the chance. My summer plans are a trip to see the granddaughters and a cruise to the Baltics. I can't wait for either one. Wow, I was just living vicariously through you with your trip to market. I wish I could do those things. With all of my heart I do. But we're struggling. As such, my big plans this summer is to get my enlarged garden going so I can put some food up for the winter. I really hope I czn make it to atleast one quilt shop this year so I can add to my dwindling stash fabric. Exciting, I know. Unfortunately, my big summer plan is to spend a month in Houston while my brother has surgery at MD Anderson cancer center, then accompany him back to his home in Chicago. I've seen this ruler demonstrated at shows but never pulled the trigger to buy it. Deco Shimmer would be my pattern choice. I keep pondering the ruler so am grateful for another chance at winning it! I have schoolage kids so am still looking for summer camps for them, so they can be out of the house so I can sew. Also a cruise with the extended family is in the works, I really enjoy your blog, thanks so much! Well, as much as I'd like to say I'm going somewhere exotic this summer, the fact is I will be home. My son-in-laws mother had a brain tumor removed earlier this month and has not been able to babysit so I have picked up her duties in addition to my current babysitting duties for my other daughter. But, I do hope, on my one day off and weekends that I can manage to get in some sewing, some flea marketing and maybe a shop hop. Thanks for the opportunity, my email is qltdiva1@fuse.net, should I be lucky enoguh to win. I will be staying home until mid-July. Then my husband and I will be traveling to western Illinois. We will be taking care of our granddaughter while our daughter is in Ireland for 3 weeks chaperoning a group of college students. I've been thinking about buying this ruler and I'd love to win it. Thanks for the chance. Summer plans here are to have no plans :) The only requirement is that hubby actually puts time off on the calendar so that it happens, then we'll play it by ear and decide what to do when we get up in the morning. There may be camping involved, or not. A road trip, or not. :) Thanks for the chance to win the ruler. I've been on the fence about trying this one but I think you've talked me into it whether I win this particular one or not. Love the Metro Rings pattern, that looks amazing, thanks for the chance to win the ruler and this great looking pattern. travel with DH on a business/ vacation trip to New Mexico and explore some of this beautiful state. Have a happy summer creating new quilts! I'm buying a longarm machine next weekend and plan to spend the summer learning to use it. My big vacation isn't until next february when I go to Iceland for two weeks. I was thinking about getting this ruler myself-curves seem like they would be really finicky to sew. This summer I am going to summer camp with my sister! We're going to the John C Campbell folk school and learn how to make bobbin lace. We haven't gone to camp together since we were 6 and 7 so this will be really fun! No vacation plans for this summer, but 3 grandkids from Florida will be visiting ! Would love to try the new ruler & make Deco Shimmer. Two bucket list items to check off this summer, each one a day's drive but in opposite directions and different months. We will go to Mt. Rushmore in July and to Del Mar for the horse races in August. I found these curved projects so lovely. No plans to travel.....have a wedding in September to prepare for! Their projects are wonderful! DH and I will be going on a two-week boating vacation; the rest of the summer I plan to quilt, quilt, quilt! This summer I'm going to be continuing to plant up my new garden in between sitting and admiring all the work I've done so far! Urban Nine Patch, hands down! A low-key summer for us -- 4 days in Richmond, 2 days in Baltimore, 3 days in Ohio, all visiting family or friends! Urban Nine Patch is the pattern for me. I'll be staying home for the biggest part of the summer. But if every thing goes well, we will be going to Sicily, Italy in september! Would love to learn something new! This ruler would surely help. I will be staying home this summer also, and enjoying making a few quilts and spending time with my granddaughter. Summer! I just got back from my summer trip...Paris. We went a little early to beat the crowds. It was wonderful. The flowers were in bloom. We climbed all 398 stairs to the top of Notre Dame, went up to the 3rd level of the Eiffel Tower, saw Napoleon's tomb, shopped for fabric in Montmartre, and marveled at the wonderfully old architecture. Oh, and ate and ate and walked and walked. I would love to give curves a try. I agree that the right tool makes learning a new technique easier with better results. HI Thelma! I stay home in the summers because I am fortunate enough to live in the mountains of sun valley ID. The weather in the summer is beautiful ,warm days cool nights and the sun is aways shining so we can hike, bike, play or swim. Of course I sew n the summer but I prefer to do hand work sew I can take it outside. Many thanks for the contest I love your blog. lucky your Laura, i miss Idaho every day. we moved from Pocatello seven years ago and i still miss the beautiful mountains and the weather. Love sun valley. have a great summer. would love to win a curve ruler. thanks for the chance. I would love the chance to win the curved ruler so I can learn something new. My summer will be busy getting to know my grand triplets that were born on Monday!!! We now have two granddaughters and one grandson who are going to need to quilts. Thanks for the opportunity to win. Besides a kitchen update that will be starting shortly, I'd love to travel to the Glacier Nat'l Park and Yellowstone Nat'l Park thissummer leaning towards fall if need be. I would love to try that ruler! I imagine you use a small rotary cutter to fit the curves. Isn't that poinsettia block beautiful! My summer plans - leaving Thursday for a stop in Orlando to use our last 2 days at Disney - with my besties, my grandgirls. Then a little further south for a week, only to hurry home and play with those girls as their mom is dropping them off. Then we just may go to MA to visit some other grands and greats - I'll be ready to spend the rest of the summer inside sewing! Hope you get to see your daughter also.